It really doesn’t take a lot of money or fancy toys for kids to have fun staying cool in the summer time. On those sticky, sweltering days sometimes all you need is a simple garden hose, your basic lawn sprinkler – and maybe just a little bit of creativity. Along with simply running back and forth to get soaked (always fun by itself to begin with anyway), there are a myriad of other fun ideas that can keep kids interested and occupied (and cool!) for longer. Here are a few to get you started, then let your own kids’ creativity take over! 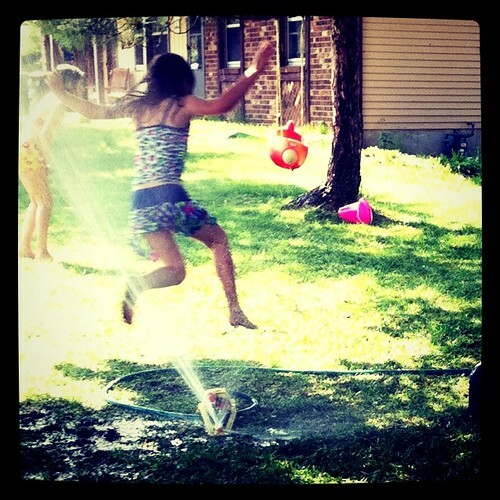 Sprinkler Tag – A variation of the usual playground game, but spiced up by requiring players to run through the water to get away from ‘It’. Just remember to caution kids to be careful when running on the wet ground, as it gets slippery. Ring Around the Sprinkler – Fun especially for smaller kids who enjoy this game to begin with, and everyone ‘falls down’ into the wet grass at the end. Sprinkler Rain Day – Hand out umbrellas and give everyone the challenge to try and stay dry while running back and forth through the water. Follow the Leader… through the Sprinkler – Let the ‘leader’ take everyone over, through, around or however else they want to interact with the sprinkler and the spraying water. Catch the Water – Arm everyone with plastic buckets and see how long it takes to fill them simply by standing in various spots underneath the sprinkler. Splashing in Street Clothes – If you don’t mind throwing everything in the laundry when you’re done, let the kids run through the sprinkler in their regular play clothes. They’ll get a blast from the novelty of being allowed to get their shorts and shirts wet! Really, just about any typical playground game can be adapted to create additional fun when playing in the sprinkler – ‘Mother May I’, ‘Simon Says’, ‘Red Rover’, and more. Or let your kids make up their own games as they go. But don’t forget to put on your own bathing suit and join in – it’s a great way for mom or dad to stay cool and join in the fun too!